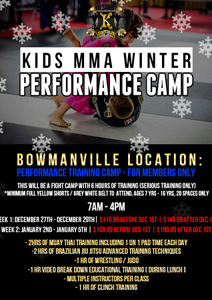 * Requirement: Minimum Full Yellow Shorts / Grey White Belt to attend, Ages 7yrs - 16 yrs, 20 spaces only. Camp of Champions is a summer day camp program in Bowmanville. The camp of champions provides children between the ages of 3 to 15 the changes to learn, laugh, socialize and do all kinds of fun stuff. Our summer camp do activities including trips, games and basic self defense. Camp of Champions also provides other day camps including P.A. Day Camps, Winter Camps and March Break Camps.